Coastal Rugs Capture the Color of Sand and Sea! Our coastal rug collection includes accent and area rugs that complement a nautical, beach or coastal theme with rich, vibrant color palettes of blues, whites and greens. Accent rugs are great in entry ways, small rooms and as an anchor to bring the décor of small rooms or spaces together. Area rugs are larger and cover a center focus under central living room furniture, dining room tables, or bedroom furniture setting. Many of our rugs can be ordered in varied sizes to meet your design needs. Sand Dollar Indoor, Outdoor Rug This easy care coastal rug from Pacific Home ..
Nautical Inspired Indoor, Outdoor Rug This easy care coastal rug from Pa.. 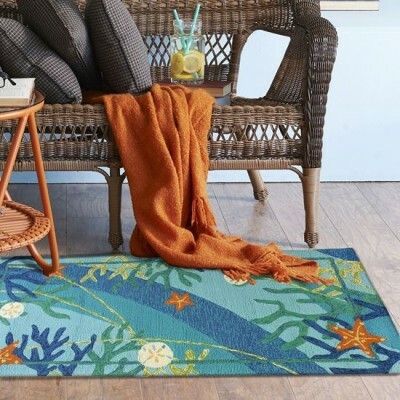 Accent Rugs Pacific Home Furniture’s Blue Crab Beach Coastal Rug is bea..
Butterflies & Dragonflies Indoor - Outdoor Rug The Butterflies & Dragonflies co..
Pacific Home Furniture's Chevron and Coral Coastal Rug is beautifully designed to add a coa.. Accent Rugs Pacific Home Furniture’s Coastal Egret coastal rug is beaut.. Accent Rugs Pacific Home Furniture’s Coastal Turtle coastal rug is beau..
Coastal Accent Rug Pacific Home Furniture's Coral & Stars Coastal Rug is b..
Indoor - Outdoor Coastal Rug PacificHomeFurniture.com's "Coral Waves"..
Pacific Home Furniture's Flamino Blue Coastal Rug brings out a pop of color with these nati.. Global Fusion Indoor-Outdoor Coastal Rug Global Fusion is a perfect coastal rug for any..
La Mer Coastal Indoor, Outdoor Rug Enjoy this easy care coastal rug as a..
Lighthouse Brigade Nautical Indoor, Outdoor Rug Enjoy this easy care nautical rug&..
Nautical Inspired Indoor, Outdoor Coastal Rug Enjoy the nautical plaid pattern o..
Navy Blues Coastal Rug Are you looking for something to cover that blank area on .. Accent Rugs Pacific Home Furniture’s Neptune coastal rug is b..
Oceanside Sandpiper Coastal Rug Pacific Home Furniture’s Oceanside Sandpiper..
Indoor - Outdoor Tropical Rug PacificHomeFurniture.com offers a colorful..
Pacific Home Furniture’s Reflective Sandpipers coastal rug is beautifully designed a..
Nautical Inspired Indoor, Outdoor Coastal Rug Add a splash of color to your outdoo..
Nautical Themed Indoor Rug Pacific Home Furniture’s Sailing Day coastal rug .. Sand Dollars & Stripes Indoor, Outdoor Rug This easy care coastal rug fro..
Beach Accents Indoor, Outdoor Coastal Rug Sanddollars By The Sea coastal rug will ..
Pacific Home Furniture’s Sanibel Shells & Coral coastal rug is beautifully desig..
Coastal Colored Indoor, Outdoor Rug Enjoy this easy care striped pattern coastal r..
Sea Glass Sand Dollars Indoor, Outdoor Coastal Rug Enjoy the sand dollar an..
Pacific Home Furniture’s Seahorse Medallion coastal rug is beautifully designed and ..
Coastal Inspired Indoor, Outdoor Rug This easy care coastal rug from Pacific ..
Beach Accent Rug For Your Coastal Theme This Starfish Field Coastal Rug from ..
Beach Inspired Rug This Starfish coastal rug from Pacific Home Furniture is a beau..
Starfish Scatter Coastal Indoor, Outdoor Rug Enjoy this easy care coasta..
Coastal Theme, Turtle Rug This Turtle Medallion Rug from Pacific Home Furniture is a be.. Ocean Blue Colored Indoor-Outdoor Coastal Rug Underwater Coral & Starfish is one of..